Some Hamilton County school board members think it's time to reignite the panel's conversations about equity. The debate about the gaps in student achievement, segregation in county schools and how the district should tackle those problems was ignited this summer after the board received two sets of recommendations from the NAACP and UnifiEd, and board members Rhonda Thurman, of District 1, and Joe Smith, of District 3, released a statement denouncing UnifiEd's report and denying segregation was an issue in county schools. In anticipation of Superintendent Bryan Johnson's monthly update at Thursday's board meeting, Kathy Lennon, of District 2, said she's ready to move forward. "As a school board member, I'm hoping that we will get to move forward with the work," Lennon said, referencing a proposal to bring in outside equity consultants that was tabled earlier this year. Schools superintendent Bryan Johnson, right, speaks next to board member Kathy Lennon amid a discussion about equity in the school system during a Hamilton County Board of Education work session on Thursday, June 21, 2018, in Chattanooga, Tenn. In March, Johnson created the district's Equity Task force and in May the board voted to bring in national diversity consultant Michael Alves and his team to meet with district leaders and discuss the nature of Alves' work. Alves, president of the firm, agreed to join the task force at its June meeting to help facilitate and to develop a plan for the work. At the time, the board had approved district efforts to seek private money to bring in the consultants. 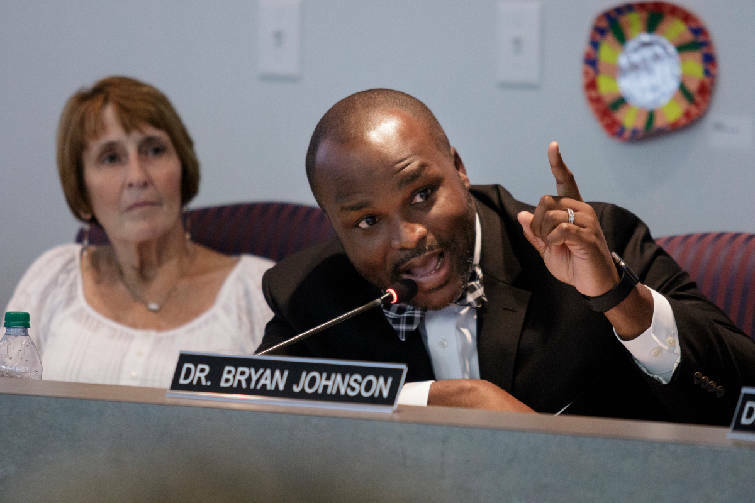 In June, though, that process was halted and the board instead voted to bring in several facilitators instead, despite Johnson confronting his board. "You all set the direction and the vision for the district. It is important for me to understand that," Johnson said. "But I need to ask you, is closing the opportunity gap still a priority for you?" The board pumped the brakes after the weeks of controversy and confusion Thurman and Smith's statement prompted and the backlash it received. Community members, organizations and advocates had spoken out both in favor of and against the school district's actions, including about the 8-1 vote on May 24 to allow the school system to seek private funds to bring in national diversity consultants to work with the task force. The Hamilton County Board of Education will meet for its monthly regular board meeting at 5:30 p.m. Thursday in the board room at the Hamilton County Department of Education at 3074 Hickory Valley Road. New board member Tucker McClendon, who beat out former board member David Testerman for the District 8 seat this August, said politics affected the process over the summer. "Politics got in the way, and we need to have real conversations about real issues we have," McClendon said. "Whether we decide to do this work ourselves or bring in outside consultants, we have to have real conversations and keep politics out of education." Lennon said she hopes the board is ready to consider Alves' group. "I'm ready to invite them to come and talk to the board so the board can ask them questions and so we can move forward," she said. "I'd love to have a work session with them if we can arrange it." Board member Jenny Hill, elected in August to represent District 6, also said the district needs to renew its conversation about equity. "One hundred percent, we need to renew the conversation about the work that the equity task force has been tasked with doing," she said. "Within our strategic plan, closing the opportunity gap is one of the most important things we will be doing. I am a champion of closing the gap because every student matters." Hill said she has spoken with Johnson and hopes to hear his recommendations for how the district should move forward. Achievement, or opportunity, gaps generally refer to student achievement differences between students of different socioeconomic statuses or races. In Hamilton County, white students outperform students of color, and minorities are generally concentrated in particular schools. A report published Tuesday by ProPublica found that, on average, black students in Hamilton County are "academically 2.5 grade levels behind white students." Thursday's board meeting agenda includes a presentation from Johnson updating the board on Future Ready 2023. Johnson would not confirm if the update is a direct update from the equity task force, which has not met since June. The public file attached to the board's meeting agenda as of Wednesday night was only a one-page memo without details of the presentation. Lennon said, depending on the update, she was ready to "push a little bit" for progress. McClendon agreed. He hopes to see progress, but is not sure if closing opportunity gaps is something the district needs outside consultants to tackle. "I want to see us making strides in closing the opportunity gap and see that all students have the same opportunities; that we are making strides in equity," he said. "And we'll see tomorrow [Thursday] night if those steps are being taken."